Runshaw College is a further and higher education college situated across three centres in Leyland and Chorley in Lancashire. It’s the only college placed in the top three nationally for three central educational measures: average grade achieved, average points scored per-entry, and added value. Runshaw’s website was showing its age. It was not only difficult to navigate, but on mobile and tablet devices it was completely non-responsive. A mixture of poorly organised content, presented in a dated interface, led to many potential students facing a frustrating user experience, whilst visually the website didn’t represent their brand. Runshaw is a unique educational environment. The college has a noticeable energy about it and we wanted to reflect this on the new website. A mobile first approach was a given as 75% of their traffic is through mobile and tablet devices. However, we also wanted to innovate through the simplification of content, the user journey, and the website navigation. This innovative approach is, essentially, the opposite of what their peers currently use for their academic websites. Having put our school, college, and university web design and marketing skills to effective use before, our experience gave us a fantastic insight into how respective student bases interact, discover, and engage with content. 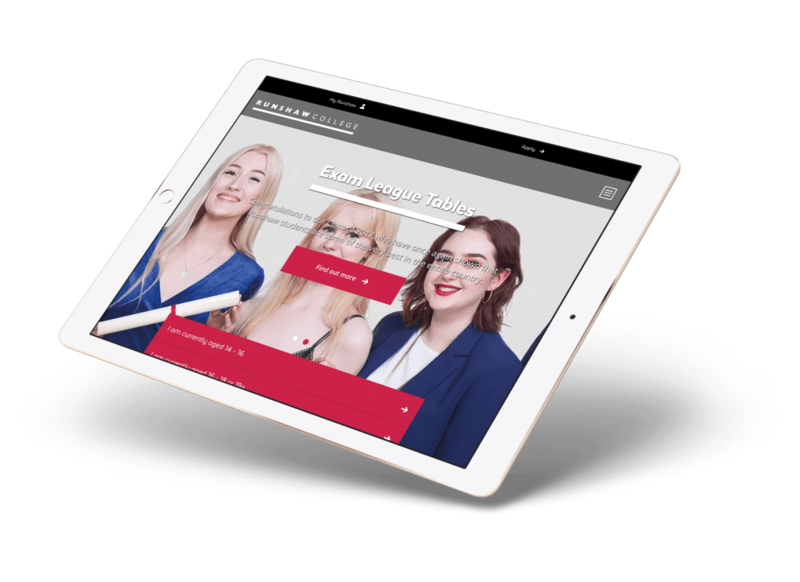 For Runshaw College, we wanted an elegant solution to the user journey accompanied with a tone of voice which was conversational. We also wanted to move away from the top down style menus often seen in academic institutions, which are frequently burdened with hundreds of choices. As a result, we ditched the industry standard mega menu due to its impracticality for mobile. In its place, we created a progressive journey through the site by segmenting the user into key personas. Before developing the UI, we invested a lot of time understanding each user’s intent, along with what they wanted with regard to information from the site, by reviewing the history of their analytics account. From this, it was clear there were a lot of pain points and drop off rates, so we developed a UI and journey tailored to each user persona. This was a process of reduction and simplification – it was about fewer options and more space, and a clear path through the site. This approach helped us to avoid the common mistake of overloading the user with choices. 75% of all traffic from external IP addresses to the Runshaw College website is from tablet and mobile. Our mobile first approach provides a cutting edge solution by making the website as usable as possible. Through a simplified approach to navigation, and by presenting a flow based on each user persona, the site saw an immediate rise in engagement and bounce rate dropped fourfold. Don't just take are word for it! Soap were really easy to work with throughout the duration of our website project. The end result is great, we now have a website in keeping with our status as the top college in the country!